Klaus is back with a cool new way of playing with the Santa Claus mythos. BOOM! 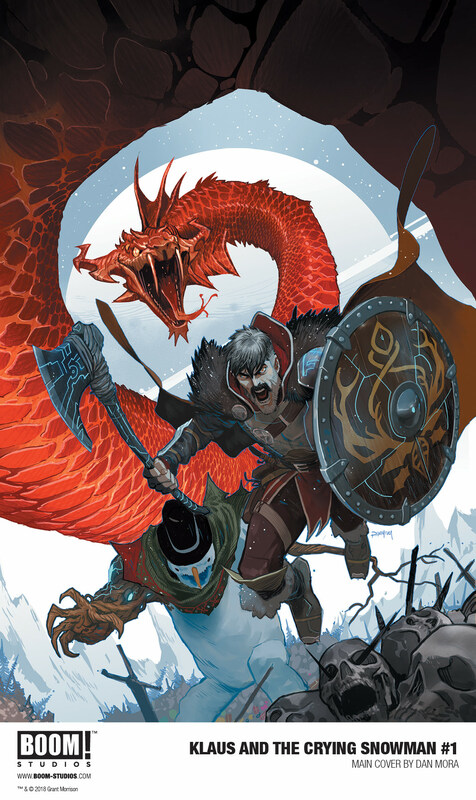 Studios today announced KLAUS AND THE CRYING SNOWMAN #1, the next chapter in the Eisner Award-nominated bold reimagining of the Santa Claus mythology for modern audiences from visionary writer Grant Morrison (Green Lantern, All Star Superman) and superstar artist Dan Mora (Power Rangers: Shattered Grid), debuting in December 2018. Santa Claus is a myth. He’s a legend. He’s loved worldwide by children and adults alike . . . but does anyone truly know his origin and greatest adventures? Launching in 2015, Klaus has revealed this hidden history, from a dark fantastic past of myth and magic, to modern stories of holiday cheer and terror. KLAUS AND THE CRYING SNOWMAN #1 continues the annual holiday tradition of new Klaus comic book releases, dating back to the franchise launch. Now, Klaus must help an absentee dad-turned-snowman make amends before melting away for good. And probably before he’s defeated by a pantheon of Norse Gods and their minions. All in a day’s work for Santa Claus, right? KLAUS AND THE CRYING SNOWMAN #1 features a main cover and a variant cover both illustrated by Mora. KLAUS AND THE CRYING SNOWMAN is the latest release from BOOM! Studios’ eponymous imprint, home to a world-class group of licensed comic book series and ambitious original series, including Joss Whedon’s Firefly, Mighty Morphin Power Rangers, WWE, Planet of the Apes, Abbott, Mech Cadet Yu, Grass Kings, and Bone Parish. Print copies of KLAUS AND THE CRYING SNOWMAN #1 will be available for sale in December 2018 at local comic book shops (use comicshoplocator.com to find the nearest one) or at the BOOM! Studios webstore. Digital copies can be purchased from content providers, including comiXology, iBooks, Google Play, and the BOOM! Studios app. Additionally, KLAUS: THE NEW ADVENTURES OF SANTA CLAUS, an all new hardcover collection of the titular hero’s acclaimed holiday specials, will be available for sale in comic shops on September 26th and in bookstores on October 2nd. KLAUS: HOW SANTA CLAUS BEGAN, the hardcover collection of the original award-winning series, is currently available everywhere books are sold.